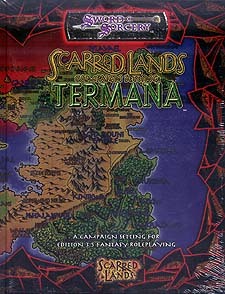 A land of verdant jungles, steaming swamps and impassable mountains, Termana is a wild land full of diverse and often dangerous cultures - from the notorious Charduni Empire to the ancient high elven nations to the infamous Carnival of Shadows. This volume details the history of the Scarred Lands' southern continent, from the vast titan-worshipping empires that once covered it to the shattered cultures that struggle for dominance in the current era. Requires the use of the Dungeons & Dragons Player's Handbook, Edition 3.5.